Grandpa Shaw loves counting stars. One evening he was sitting in his armchar, trying to figure out this problem. Consider the sky as a rectangular coordinates, each star has a coordinate (Xi,Yi). To make it simple, all the stars are in the first quadrant. Now he want to know how many stars there are in the square formed by (0,0) and (x,y). There are n stars in the sky, and he raised m questions. Because grandpa Shaw's eyesight is poor, he ask you for help. 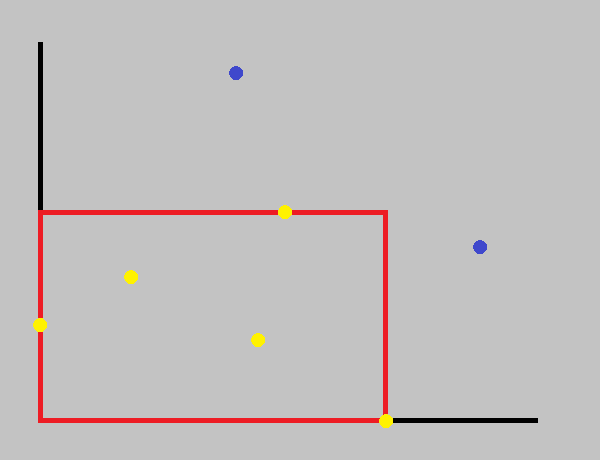 in this image, yellow stars are in the square, blue ones are not. multiple test cases, please read until EOF. first line contains two integers n m (0 <= n, m <= 10^5). following n lines each line contains two integers Xi Yi (0 <= Xi, Yi <= 10^6). following m lines each line contains two integers x y (0 <= x, y <= 10^6). first line "Case #t:" t is the number of test case. following m lines, each line contains one integer, the number of stars in that square. first question of the test case is as the image shows. input data is large, DO NOT use cin, use scanf instead.